It was spectacular! All the fruit, tannins and acids were still there, but seamlessly blended together like a regal old Bordeaux. Fantastically smooth in the mouth and perfect for the steak, potato, and salad that we prepared to go with it. It was etherial. Aged wines are a different thing. Most people never get the chance to taste an aged wine like this, and it’s a wonderful thing to experience. 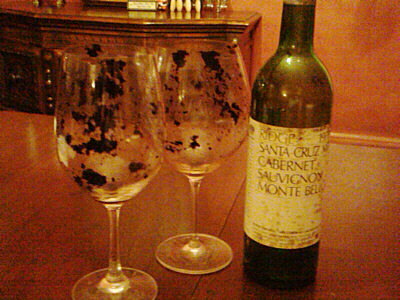 And look at the sediment that was left in the glass! You can avoid that by carefully decanting the wine first, but it isn’t necessary. Are we offering aged wines like these in our gift baskets? Well, not regularly. But call if you want something special. You never know what we might have lying around.